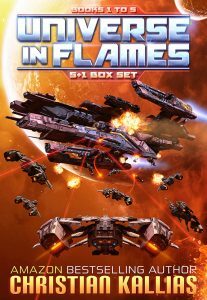 This Box Set contains the first 5 books of the Universe in Flames saga (+ a bonus novella) at a competitive price point & with new cover. When the Star Alliance is attacked, ace pilot Lieutenant Chase Athanatos and his friends attempt to survive the total annihilation of their kind. Their struggle for survival brings them to a world far far away, a little planet called Earth. Little do they know that in doing so, they’ll expose humanity to the biggest scourge the universe has ever faced. Nothing is ever as it seems in this thrilling, action-packed Science Fiction Space Opera series. Greek mythology and fantasy elements add a dab of mysticism and originality to the intense and suspenseful adventures of Chase: a man unaware of his past, a man who must learn to get a grasp with what destiny and the Gods of Olympus have in store for him. Unwilling to let evil unleash their minions upon every soul in the universe and armed with his courage, convictions, as well as the help of the gods themselves, Chase fights not only for his own survival but for everyone’s, on Earth and throughout the galaxy. Universe in Flames is a completed 10 book best-selling series (over 150,000 copies sold). A sequel series (UiF Dark Legacy) is in the works. If you haven’t yet read the acclaimed & award-winning Universe in Flames saga, now is your chance. This book can be read FREE with Kindle Unlimited and is currently Free with Prime Reading. Aided by an abundance of Sci-Fi characters with supernatural powers, Bestselling Sci-Fi author Christian Kallias has a secret. He lives two lives. One in the real world and one inside his own creations, in worlds where he can lay down the foundation of his universes for both his and your enjoyment. Guess which world he prefers? Christian Kallias is the bestselling author of the award-winning Universe in Flames Space Opera series. Book 1 (Earth – Last Sanctuary) and Book 4 (The Beginning of the End) have both won the New Apple Book Awards: E-BOOK SCIENCE FICTION Solo Medalist Winner awards.